Hi, my name is Kangaflora, as you can see below, I've been into Pokémon since 2000. Below is also the list of games that I owe (Pokémon related). 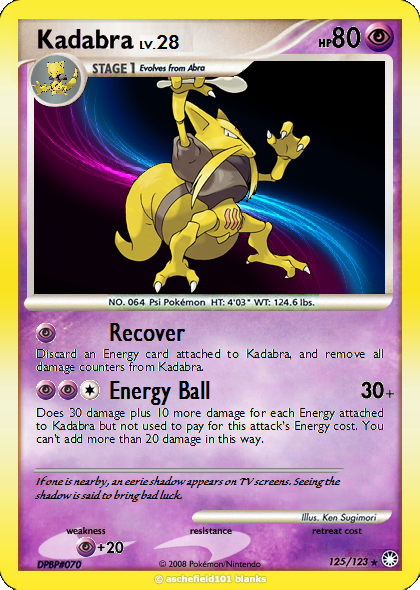 My favourite Pokémon at the moment is Kadabra. Above is the link of a petition to get Kadabra back into the Pokémon Merchandaise (including the TCG), I personally feel that the whole Kadabra incident could've been handled a lot better than it was. The next games he will be purchasing are Pokémon UltraSun and UltraMoon. As you may or may not be fully aware, Uri Geller tried, and failed, to sue Nintendo over Kadabra because of it's Japanese name (Yungerer). I have been looking very carefully at how Uri Geller should've handled it. Rather than getting Kadabra banned worldwide, he could've taken the more mature approach, which was to ask them nicely to change Kadabra's Japanese name from Yungerer to, let's say for example, Shazam (ジャーン) (prounced Jãn). That would've allowed the Pokémon Company to carry on producing Kadara cards, and Kadabra merchandise, and both parties would be happy as there is no reference to Uri Geller himself. What do you think? NB: This list is almost in the exact same order as the National Pokédex except with Evolutions put together. Will be updated in due course. This page was last edited on 3 November 2017, at 16:17.